Congresswoman Elizabeth Esty. November 2017 photo by Christine Stuart/Courthouse News. HARTFORD (CN) — Faced with calls from fellow Democrats for her resignation, three-term Congresswoman Elizabeth Esty said Monday she will not seek re-election, due to her handling of reports of abuse by her former chief of staff. Esty has come under fire since Hearst Connecticut Media and The Washington Post reported last week that she had not fired Tony Baker immediately after hearing of a May 2016 incident in which he allegedly threatened a staffer with whom he had had a relationship. Baker was fired three months after an internal investigation was completed. He received $5,041.67 in severance and a letter of recommendation from Esty that landed him a job as the Ohio coordinator for Sandy Hook Promise, which fights gun violence. Esty and Baker signed a nondisclosure agreement concerning the details of his termination. Esty fired Baker on July 20, 2016, after an investigation she commissioned showed a pattern of abusive behavior culminating with a May 5, 2016 alcohol-infused reunion of former and current staff members, Hearst Connecticut Media reported. Esty insisted in interviews with Hearst and the Post that she did not know the young female staffer — Anna Kain, who has since gone public with her allegations — had been in a relationship of any kind with Baker, let alone an abusive one. Kain was hired in January 2013 as Esty’s scheduler. She was promoted a year later to senior adviser and left the office in March 2015, according to House records. 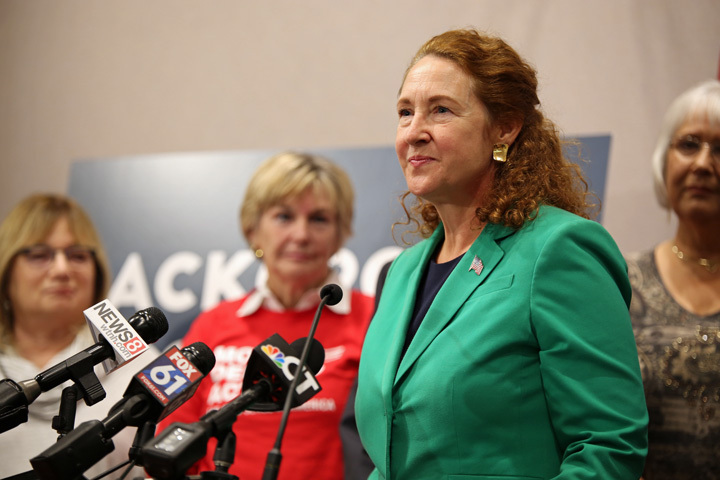 As the reports of how Esty handled Baker’s termination continued, Connecticut Democrats began to call for her resignation. State Senator Mae Flexer, D-Danielson, was the first Democrat to call for Esty’s resignation, last weekend. She was followed by other powerful Democrats, including Senate President Martin Looney of New Haven. “I agree with Senator Flexer that if the facts of this matter involving former staff of the congresswoman’s office are as they are alleged to be in recent news articles then Congresswoman Esty should do the right thing and resign,” Looney said. Kain posted on her Facebook page last week that the story is not about her, but about Congress as an institution. Earlier Monday Esty called on the House Ethics Committee to investigate her for any wrongdoing in the dismissal of her former chief of staff. Connecticut’s 5th Congressional District is a swing district that Hillary Clinton won by just a few points in 2016.